Your safety and safe lifting is our number one priority. Make sure to read the safe lifting instructions/manuals before using Terrier lifting clamps. Each product sheet gives extra information on safe lifting and specific application. Never work with an untested clamp. Keep your distance when lifting and never stand under the load. Do not use the clamp if (it has been) damaged; have the clamp immediately repaired by Terrier Lifting Clamps BY or a recognized mechanical repair centre. If in doubt consult your supplier. Never lift more than one plate or a package of plates at a time (except the THSK). Never lift plates heavier than the working load limit (W.L.L. ), as indicated on the clamp and in the test certificate. Do not lift plates which are thicker or thinner than the jaw opening, as indicated on the clamp and in the test certificate. 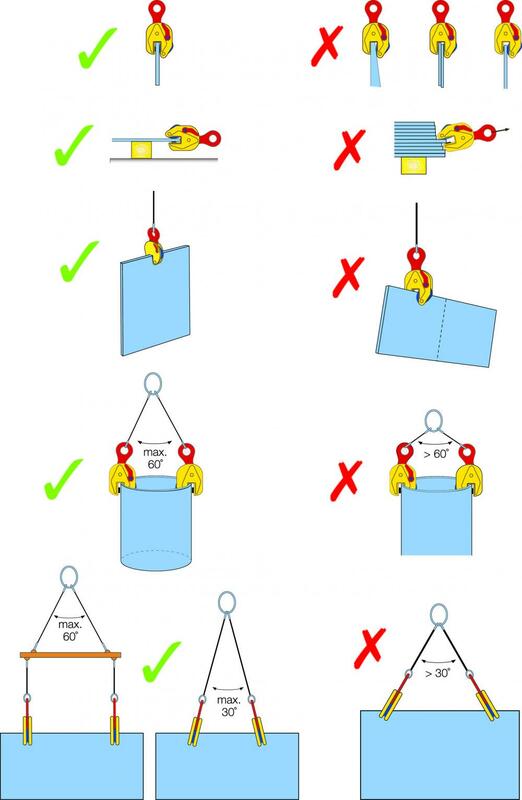 When using a number of lifting damps at the same time, please provide lifting slings or chains of a sufficient length to ensure that the angle between the slings or chains never exceeds 60°. 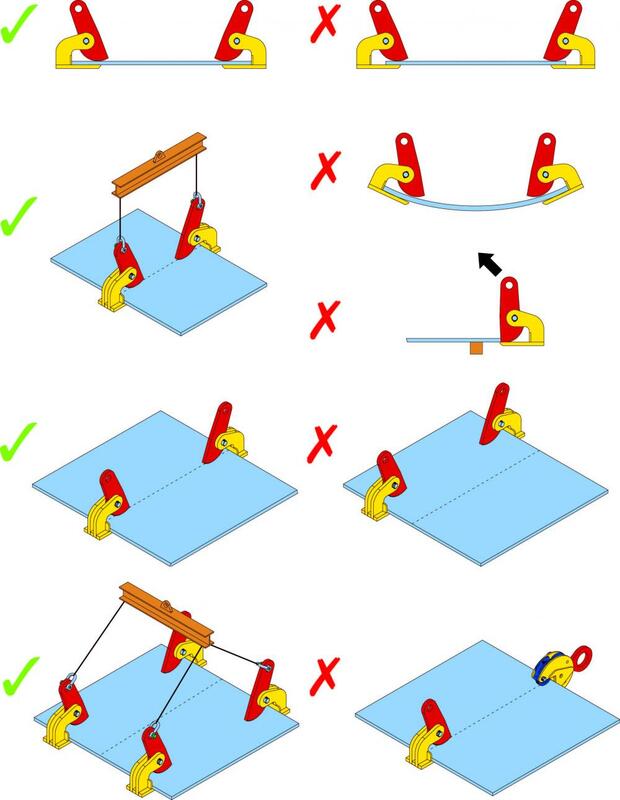 When simultaneously operating a number of lifting clamps time side by side, please use a lifting beam (equalizer) and lifting slings or chains of a sufficient length to ensure that the lifting shackles on the clamps are never subjected to lateral load. Do not place the clamp on tapered or conical sections of the plate or structure to be lifted. Remove all grease, oil, dirt, corrosion and mill scale from the plate at the point where the clamp is going to be attached. The surface hardness of the plate must not exceed 37 HrC (345 Hb, 1166 N/mm2) (except the TNMH). The clamp is only suitable for use in normal atmospheric conditions.